Pop a cold one into an insulated beer bottle holder to keep it that way for up to two hours. 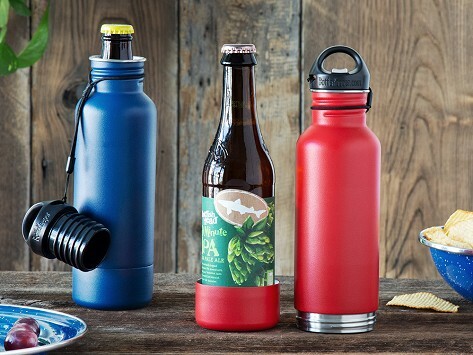 The neoprene-lined stainless steel koozie locks coldness in and fits most 12-ounce bottles. The tethered lid has a built-in bottle opener and the screw-on base is padded for extra protection. Guaranteed to last a lifetime. BottleKeeper Maker Matt Campbell was at the beach trying to enjoy a cold beer, but the plastic cup he was drinking from did nothing to help keep his drink cool. Inspiration struck and, along with cousin Adam Callinan, he created an insulated beer bottle holder to do the job. Down at the holder's base, extra padding helps protect a bottle from drops when you're at places like the beach, by the pool, on the boat, or when you just want to chill in the backyard with a cold one.